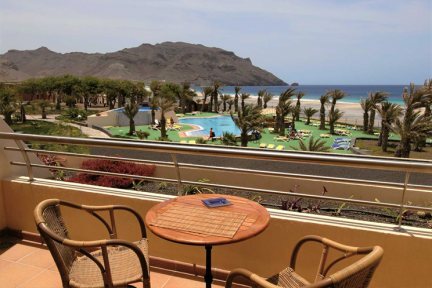 Set in spacious grounds and boasting a peaceful and picturesque setting, Foya Branca is ideal for both an active and relaxing stay on São Vicente. The gardens are spread over a large area, providing a relaxing, peaceful feel throughout the resort. Sea View rooms are included as standard, offering outside space with wonderful views. The hotel offers a complimentary shuttle service to Mindelo, just a short drive away. Set just 15 minutes from the eclectic town of Mindelo, Foya Branca is situated in beautifully kept gardens and offers plenty of peace and quiet after a day exploring the many attractions of the island, this is a hotel that caters to all kinds of holiday-maker. For those who want to simply relax, there’s a large pool which boasts fantastic sea views, and for beach lovers, São Pedro Beach offers a long, golden stretch of coastline just outside the property which is ideal for soaking up the sunshine. The extensive grounds include two large swimming pools, a children’s pool and play area, plus a gym, tennis courts, pétanque and a giant chessboard. If you’re the kind of holiday-maker who prefers to get more active during your holiday, water sports can also be enjoyed from the beach including windsurfing and diving , while horse riding can also be organised, making for a great family day out. The comfortable guest rooms are simple in design but blessed by superb sea views, helping you make the most of your enviable position on São Vicente. Set over two floors, the rooms are light and airy with good furnishings and facilities such as a television, air-conditioning and a safe. The hotel offers a tasty buffet restaurant, while guests can also take advantage of two bars and a lunchtime snack bar in which to dine. If you’d rather head out for dinner, you’re only a 15-minute shuttle away from Mindelo, where a great selection of bars and restaurants can be found, along with plenty of live music to give you a true taste of Cape Verdean culture. Travelling time between Sal and Santiago is approximately 45 minutes flying time. These rooms have twin or double beds, with a balcony or terrace, located on the sea side of the hotel. they sleeps up to 3 people. 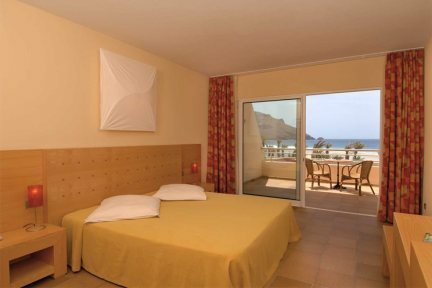 These rooms have twin or double beds with a balcony or terrace and are located on the sea side of the hotel.